Our microbiome study is now closed. We appreciate the participation of so many of you! As a long-term study with 55,000 participants, Alberta’s Tomorrow Project (ATP) can help researchers learn which changes in the body coincide with sustained health, or the onset of disease. For example, some cancers can be detected in the earliest stages by testing for chemicals in the bloodstream that signal a developing tumour, long before the tumour itself is easily identified. The sooner a disease can be discovered, the faster it might be successfully treated. An emerging and very exciting area of investigation for disease prevention is the human microbiome. Invisible to the naked eye, microbes are tiny bacteria that live on and within us. Every person carries an estimated 100 trillion of these minute but powerful creatures! While we often think of bacteria as a threat to our health, we cannot survive without them: they break down the food we eat, produce nutrients and vitamins, and play a crucial role in keeping us healthy. In recent years, the science of the microbiome – every person’s individual and unique collection of bacteria – is revealing its potential impact on everything from cancer and obesity to mental health. 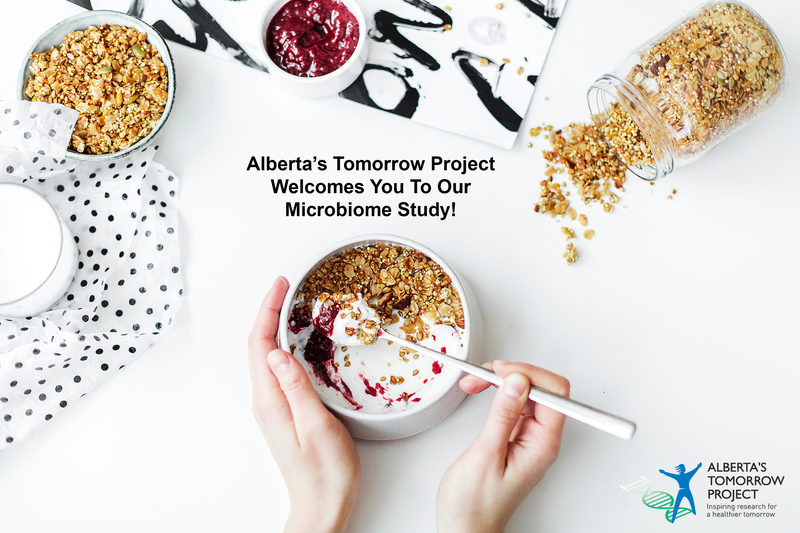 Recently, Alberta’s Tomorrow Project participated in an international project called Gut Metabotypes as Biomarkers for Nutrition and Health, or BioNUGUT. Its aim is to explore which collections of microbes are linked with ongoing health or illness. As bacteria in the gut break down food, they produce chemicals that can be detected in the blood. Thanks to blood and stool samples, detailed dietary and lifestyle questionnaires, and health records from participants, researchers will be able to determine microbiome “signatures” that suggest either health or developing disease. Such biological markers could eventually be used in health prevention or screening programs, as well as to monitor recovery after disease. Dr. Jane Shearer, Associate Professor in the Faculty of Kinesiology at the University of Calgary, recruited 400 ATP participants for the Canadian arm of this study. “We hope to learn what lifestyle factors, such as diet and exercise, are important in shaping this gut microbiome in health and its roles in the initiation, development and progression of chronic diseases such as cardiovascular disease, obesity, type 2 diabetes and inflammatory disease,” notes Dr. Shearer. Taking part in the BioNUGUT study involved completing online questionnaires about what participants eat, and how active they are. Participants were asked to come for a morning appointment at our study centre at the Richmond Road Diagnostic Centre in Calgary. Participating also involved returning a small sample of a bowel movement to us. Throughout the summer and fall of 2018, participants were randomly invited to take part in the BioNUGUT study. Frequently asked questions related to the microbiome. Our phone number, email, and mailing address are located here.